Follow "3 Basic Steps" to create a professional finish & use these techniques to any application. (Step 1)Trace & ( Fill 2) Raise higer (3) Brush. Repeat (1-1) and (1-2) for each section. Make sure you leave spaces between each section. Space prevents 3-D Crystal Lacquer from running together, which then creates the distinctive 3-D effects. 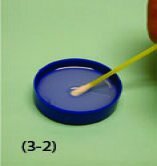 (2-1) After the first coat dries, reapply 3-D Crystal Lacquer over the areas you already raised to make a deeper 3D Effect. (3-1) & (3-2) Moisten brush or cotton swab with water before diping into 3-D Crystal Lacquer. 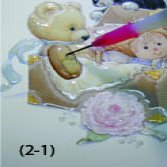 (3-3) Apply 3-D Crystal Lacquer over the entire image, including foreground, background and all spaces you made in Step1. This process is not raising but connecting all sections of images with thin coats.